For the administrative region, see Gozo (region). For the island's short lived independence, see Gozo (independent state). Gozo, known locally as Għawdex (pronounced [ˈaˤːw.dɛʃ]) and in antiquity as Gaulos (Punic: 𐤂‬𐤅‬𐤋‬, GWL; Greek: Γαύλος, Gaúlos), is an island of the Maltese archipelago in the Mediterranean Sea. The island is part of Malta. After the island of Malta itself, it is the second-largest island in the archipelago. Compared to its southeastern neighbour, Gozo is more rural and known for its scenic hills, which are featured on its coat of arms. As of March 2015, the island has a population of around 37,342 (out of Malta's total 475,000), and its inhabitants are known as Gozitans (Maltese: Għawdxin). It is rich in historic locations such as the Ġgantija temples, which, along with the other Megalithic Temples of Malta, are among the world's oldest free-standing structures. The island is rural in character and, compared to the main island Malta, less developed. It was known for the Azure Window, a natural limestone arch that was a remarkable geological feature, until its collapse in 2017. The island has other notable natural features, including the Inland Sea and Wied il-Mielaħ Window. There are many beaches on the island, as well as seaside resorts that are popular with both locals and tourists, the most popular being Marsalforn and Xlendi. Gozo is considered one of the top diving destinations in the Mediterranean and a centre for water sports. Gozo has been inhabited since 5000 BC, when farmers from nearby Sicily crossed the sea to the island. Due to the discovery of similar pottery found in both places from the Għar Dalam phase, it has been suggested that the first colonists were specifically from the area of Agrigento; however, it is currently unknown exactly where in Sicily the farmers came from. They are thought to have first lived in caves on the outskirts of what is now known as San Lawrenz. Gozo was an important place for cultural evolution, and during the neolithic period the Ġgantija temples were built; they are among the world's oldest free-standing structures, as well as the world's oldest religious structures. The temple's name is Maltese for "belonging to the giants", because legend in Maltese and Gozitan folklore says the temples were built by giants. Another important Maltese archaeological site in Gozo, which dates back to the neolithic period, is the Xagħra Stone Circle. Also, native tradition and certain ancient Greek historians (notably Euhemerus and Callimachus) maintain that Gozo is the island Homer described as Ogygia, home of the nymph Calypso. Gozo was occupied by the Carthaginians, who raised a temple to Astarte on the islands. It was probably annexed by Rome around 218 BC and minted its own bronze coins in the 1st century BC. These feature Astarte's head with a crescent obverse and a warrior, a star, and the legend Gaulitōn (Greek: ΓΑΥΛΙΤΩΝ) reverse. In July 1551 Ottomans under Sinan Pasha and Dragut invaded and ravaged Gozo and enslaved most of its inhabitants, about 5,000, bringing them to Tarhuna Wa Msalata in Libya, their departure port in Gozo was Mġarr ix-Xini. The island of Gozo was repopulated between 1565 and 1580 by people from mainland Malta, undertaken by the Knights of Malta. The history of Gozo is strongly coupled with the history of Malta, since Gozo has been governed by Malta throughout history, with the brief exception of a short period of autonomy following the uprising against the French forces after Napoleon's conquest of Malta, between 28 October 1798 and 20 August 1801. 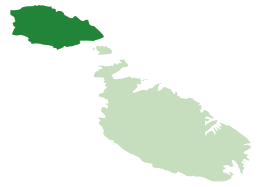 The Gozo Civic Council was set up as a statutory local government in the island of Gozo on 14 April 1961, the first experiment in civil local government in Malta since the French occupation of 1798–1800. The law authorised the Council to raise taxes, although it never actually made use of this power. In 1971 the Malta Labour Party was voted into office. As its support in Gozo was weak and it favoured a more centralised administration it proposed a referendum on the abolition of the Council putting emphasis on the unpopular possibility of it raising taxes. In the Gozo Civic Council referendum, 1973, the overwhelming majority of voters (76.97%) voted for the abolition of the Gozo Civic Council. In the mid-1980s attempts were made to set up a Gozo committee, chaired by the Prime Minister and with the Gozitan Members of Parliament as members. However, it was only in 1987 that the Ministry of Gozo was set up (demoted to a Parliamentary Secretariat between 1996 and 1998). Local government in the Gozitan localities was restored with the introduction of Local councils in 1993 with Gozo having 14 councils. The island has its own Latin bishopric, the Roman Catholic Diocese of Gozo, the only suffragan of the Metropolitan Archbishop of Malta. Gozo contains a large number of Catholic churches. The Rotunda of Xewkija, in the village of Xewkija, has a capacity of 3,000, enough for the entire population of Xewkija village; its dome is larger than that of St Paul's Cathedral in London. The church bells are rung daily for the canonical hours Matins, Lauds, Terce, Sext, None and vespers. The most famous church on the island is the sanctuary of Ta' Pinu, near the village of Għarb, in the west of Gozo. In the past, there were various options for reaching the island. Similarly, a helicopter service which connected the two ceased operations in 2006. Visitors can currently reach the island by ferry. There are regular crossings between the port of Mġarr on Gozo and Ċirkewwa on the north-west coast of Malta. The Gozo Channel Line makes the trip every 45 minutes during the summer and almost as often in the winter. A return journey costs €4.65 and takes around 25 minutes each way. The service is used by tourists and commuters (including Gozitan students who are studying at the University of Malta) and is also used to transport goods between the islands. Each year, the route is used by around 1.1 million cars, and many more foot passengers. On arrival at Mġarr, visitors can take one of the 'Hop On Hop Off' buses, which depart outside the ferry terminal and operate on a timetable synchronized to the ferry timetables. Public buses, taxis and hire cars are also available. Several proposals have been made to construct a road link between Malta and Gozo. In 1972 the newly elected Labour Party administration carried out a feasibility study that concluded building a bridge between the two islands was possible, but would have negative environmental effects. A tunnel was also considered, but found to be too expensive at the time. An online poll by The Times of Malta in 2006 found that 55% of respondents supported a road link. In June 2013 a "mega Chinese state-owned company [China Communications Construction Corporation Limited] will finance a €4 million study to assess the feasibility of a bridge between Malta and Gozo." "Depending on the feasibility of the tunnel and bridge projects, popular consultation will take place giving particular weight to what Gozitans have to say." "Gozo Minister Anton Refalo alluded to the possibility of calling a referendum to determine whether Gozitans prefer a tunnel or a bridge to connect Malta and Gozo"
The study found out that the bridge would take four years to build and construction would cost €1 billion. Apart from this, operation and maintenance costs are estimated to cost up to €4 million every year — China Communications Construction Corporation Limited is proposing to build the bridge by 2020. The idea of building a bridge is opposed by environmentalists and NGOs such as Din l-Art Ħelwa and Flimkien għal Ambjent Aħjar. An 11-km underground Sub seabed tunnel has been proposed in a report on the viability of a Gozo-Malta tunnel link by the Gozo Business Chamber (GBC) together with Transport Malta (TM). The Gozo Business Chamber is organising a Presentation by economist Gordon Cordina, of the detailed report about the feasibility of a ‘Gozo – Malta Subsea Tunnel. In 2015, members from the GBC together with representatives from TM also visited Norway, where they spoke with experts, and toured several underwater tunnels. In December 2015, a group of students joined forces to create 'Front Favur il-Mina' to support permanent connectivity, tunnel project between Malta and its sister island. Several Members of Parliament endorsed the group. A catamaran service (fast ferry) to Gozo, ferry trips from Grand Harbour and ultimately a tunnel linking Malta with the sister island, are the main proposals pushed forward by the pressure group. Addressing a conference in Gozo organised by the pro-tunnel movement, Muscat said the government intends to move forward with a project linking the two islands. Furthermore, Opposition leader Simon Busuttil confirmed during the same conference, that the PN is in favour of the project and willing to cooperate with the government. The University of Malta carried out geological and geophysical investigations in connection with a proposed sub-sea tunnel between Malta and Gozo following an agreement with Transport Malta. Scientific investigations included both desktop and field studies, passive seismic measurements, bathymetric mapping, and a seismic study. The University of Malta conducted a marine baseline study which incorporated a geological model of topography, stratigraphy, structure, geological, geophysical and tectonic properties of the study area. During this phase of the study, scientists deployed a 300-metre-long cable with a series of specialised receptors. An ‘air gun’ released bursts of compressed air every few metres. The compressed air was reflected back to the receptors. Different geological layers reflect back different frequencies. Scientists can thus determine the geological formations that lie beneath the surface and determine possible cracks. Following such tests, more tests are will be carried out, these will consist in the drilling of a series of boreholes, up to 200 metres below the sea bed to determine the rock strata below the surface. "Expressions of interest have been issued for a fast catamaran service between Gozo and Valletta as well as between Gozo and Sicily." In June 2013, the services would be aimed for use by both tourists and Maltese and would involve public service obligations. An airstrip on Gozo was proposed in the 1990s, but rejected for environmental reasons. In June 2013: "The government intends to issue a call for expressions of interest for the operation of a scheduled air service between Malta and Gozo." Many of the distances within villages are negligible and some of the roads are fairly quiet and pleasant to walk along. However there is often heavy traffic in the capital, Victoria and between Victoria and the Malta ferry. There is also a footpath network, though the paths require good shoes and a good map (they are not always clearly marked on the ground). There are longer distances if travelling between different villages, ranging from 1 to 5 km (1 to 3 mi) from one village to the next. One can also walk the whole circumference of the island (around 55 km). A local legend says that a Gozitan rambler planted Spanish Vetch (Ġulbiena tas-serp) all along the footpath so that hikers will not get lost. He also visited the Qormi valley and Gnejna area. The bus system in Gozo is run by Malta Public Transport Services Ltd. Though Arriva ceased to operate in Gozo and Malta, in January 2014, their old vehicles are still being utilised and most routes remain the same, although there have been some amendments and additions. The most noticeable change at the moment is that the discrepancy between resident and non-resident fares has been abolished with all passengers now paying €2 for a 2-hour ticket in summer and €1.50 for the same ticket in winter, although other fares apply for the Tallinja Card holders. Source: Gozo – Car Hire – Visit Gozo. Text is directly quoted. A hop-on hop-off bus service operates in Gozo. The open top bus tour of Gozo starts from the harbour of Mġarr and there are 'Hop on and Hop off' stops located along the route. In Gozo, there are 2 hop-on hop-off providers, City Sightseeing Gozo and Gozo Sightseeing. Both offer a tour service linking various places of interest on the island. Each tour includes an audio commentary in 16 languages and each tour takes 45 minutes. In 2005, the island had a population of 31,053, of whom 6,414 lived in its capital Victoria. As of 2017, the population has increased to 32,723. The crude birth rate was 7.93, considerably lower than that of 9.59 for Malta. The town with the highest birth rate is San Lawrenz (15.93) and that with the lowest is Xewkija (4.89). Gozitan landscape at Għasri viewed from the Cittadella. Gozo is famed for its character and places of interest. Some of these include the Calypso Cave and the Ġgantija Neolithic temples which are among the oldest surviving man-made structures. Gozo covers 67 square kilometres (26 sq mi), approximately the same area as New York City's Manhattan island. It lies approximately 6 kilometres (4 mi) northwest of the nearest point of Malta, is of oval form, and is 14 kilometres (8.7 mi) long and 7.25 kilometres (4.50 mi) wide. Notable beaches in Gozo include San Blas and the beach at Ramla Bay. 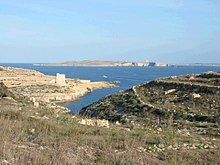 View of Mġarr ix-Xini, with Comino and mainland Malta in the background. Gozo is known for its "Karnival" (carnival). Feasts, known as 'Festi' are important traditions on the island and are held in honour of the patron saint of each village throughout the summer months. The celebrations include religious ceremonies,fireworks and live band music and some feature horse racing, concerts and in the seaside village of Xlendi, a highlight is a greasy pole competition over the water. The capital of Gozo, Victoria, also known as Rabat, has two Festi – for Saint George in July and for Saint Mary, celebrated on August 15 – a National Holiday for the Maltese islands.. During the weekend of the various festi in the villages, many Maltese and foreigners join with local people to experience Gozo’s unique carnival atmosphere. In the past, the local Festa afforded a time for young Gozitan men and women to meet, and many of those meetings resulted in formal courtship and subsequent marriage. In the village of Nadur many locals dress up in colourful and also outrageous costumes with the intention of not being recognised. Some of Maltese dishes or variants of these dishes are associated with Gozo. Gozo is particularly known for its local cheeselet, ġbejna t'Għawdex. Gozo has two opera houses. Astra and Aurora are owned by rival band clubs that both trace their founding to 1863. For over a century they have been one-upping each other in everything from musical performances to feast-day celebrations. Once, when Aurora heard rumors that Astra planned to bring a horse onstage during a performance of Aida, the competing house—which was presenting its own Aida—secretly cast two horses. Some locals on the island compare the rivalry to an arms race. The island of Gozo also has its own national football team. Because it is a part of Malta and not a state on its own this team isn't official and thereby is on the N.F.-Board. Gozo F.C. used to represent Gozo in the Maltese League, while a Gozo Football League is also maintained. Football on the island is managed by the Gozo Football Association. In Gozo one can also find a rugby club. The Gozo Rugby Club opened it doors in 2011 and nowadays, compete in the Malta Rugby Football Union and Malta Rugby League competition. Gozo was used to depict "Resolution Island" in the 1953 film Single-Handed, based on C. S. Forester's book Brown on Resolution. For much of the film, the German raider Essen (depicted by HMS Manxman) is holed up in the semi-circular Dwejra Bay, behind Fungus Rock on the west coast of Gozo, and there are several scenes set among the desolate limestone cliffs above the bay as Able Seaman Brown single-handedly detains the German ship until her pursuers can catch up with her. In 1969, Anthony Newley directed the beach scenes of his flawed Can Heironymus Merkin Ever Forget Mercy Humppe and Find True Happiness? starring Joan Collins at Ir-Ramla Bay. In 1978, Kevin Connor's film Warlords of Atlantis starring Doug McClure was shot in Marsalforn Bay. Two days of shooting in Gozo's strong Mediterranean light provided shots used to represent the desolate surface of the alien planet in the 1981 British horror film Inseminoid. In 1981, parts of Episode 7 from Brideshead Revisited were filmed on the island, particularly in the village of Kercem, to depict Fez in Morocco. Gozo was the location for Calypso's island in the 1997 Hallmark miniseries The Odyssey based on Homer's epic poem. Dwejra was one of several filming locations in the Maltese islands used for the 2011 HBO TV series Game of Thrones. The film titled By the Sea, starring Angelina Jolie and Brad Pitt was partially filmed at Mġarr ix-Xini from August to November 2014. ^ "Gozo Population 2017". NSO.gov.mt. Archived (PDF) from the original on 7 January 2018. Retrieved 20 December 2018. ^ Grenville Temple (1836). "Excursions in the Mediterranean". p. 200. ^ "Coat of Arms of the Island Region of Gozo". VisitGozo.com. October 2013. Archived from the original on 13 July 2015. Retrieved 22 June 2015. ^ "Calypso's Cave". VisitGozo.com. Archived from the original on 24 September 2015. Retrieved 22 June 2015. ^ a b "Ġgantija Temples". Heritage Malta. Archived from the original on 5 January 2015. Retrieved 16 August 2015. ^ "Where is Gozo?". Gozo & Malta. Archived from the original on 21 January 2013. Retrieved 26 March 2013. ^ a b "History of Gozo". islandofgozo.org. Gozo Tourism Association. Archived from the original on 8 October 2014. Retrieved 25 November 2014. ^ Ltd, Allied Newspapers. "Gozo's encounter with the greatest Homeric hero: The final chapter". timesofmalta.com. Archived from the original on 24 December 2016. Retrieved 2 May 2018. ^ a b Head & al. (1911). ^ a b "The Gozo Citadel: The pride of Gozo island with a tragic past!". maltabulb.com. Archived from the original on 28 July 2017. Retrieved 2 May 2018. ^ "Local Government 1773 – 1993". wordpress.com. 16 August 2014. Archived from the original on 30 July 2017. Retrieved 2 May 2018. ^ Marie, Caruana, Abigail (2 May 2018). "The Gozo Civic Council : an experiment of devolution in Gozo". um.edu.mt. Archived from the original on 28 July 2017. Retrieved 2 May 2018. ^ "Jever Steam Laundry – 98 Sqn personnel Bebe Sharman 005". www.rafjever.org. Archived from the original on 10 October 2017. Retrieved 2 May 2018. ^ "harbourairmalta.com". www.harbourairmalta.com. Archived from the original on 20 April 2013. Retrieved 2 May 2018. ^ a b Sansone, Kurt (12 June 2011). "Tunnelling towards reality". The Times of Malta. Archived from the original on 15 June 2011. ^ a b Said, Chris (31 January 2011). "Light at the end of the Gozo tunnel". The Times of Malta. Archived from the original on 3 February 2011. ^ Busuttil, Cynthia (19 February 2006). "Online poll shows big support for Malta-Gozo bridge". The Times of Malta. ^ Ltd, Allied Newspapers. "Chinese company to study Malta-Gozo bridge option". timesofmalta.com. Archived from the original on 9 March 2017. Retrieved 2 May 2018. ^ a b Ltd, Allied Newspapers. "Referendum chance over Malta-Gozo link". timesofmalta.com. Archived from the original on 9 March 2017. Retrieved 2 May 2018. ^ Massa, Adriane (23 November 2014). "'€1bn bridge for Gozo would take four years'". Times of Malta. Archived from the original on 25 November 2014. Retrieved 25 November 2014. ^ "Malta-Gozo bridge would cost €4m every year to run". Times of Malta. 24 November 2014. Archived from the original on 26 November 2014. Retrieved 25 November 2014. ^ "Updated: Bridge report should be made public – Din l-Art Helwa". Times of Malta. 25 November 2014. Archived from the original on 27 November 2014. Retrieved 25 November 2014. ^ Camilleri, Ivan (25 November 2014). "A bridge too far?". Times of Malta. Archived from the original on 27 November 2014. Retrieved 25 November 2014. ^ "Subsea Gozo-Malta tunnel has PM's endorsement, says Gozo chamber". maltatoday.com.mt. Archived from the original on 24 February 2017. Retrieved 2 May 2018. ^ "Gozo Business Chamber presentation on the feasibility of a Gozo tunnel". gozonews.com. Retrieved 2 May 2018. ^ "Front Favur il-Mina says accessibility is key for Gozo residents". maltatoday.com.mt. Archived from the original on 9 March 2018. Retrieved 2 May 2018. ^ Ltd, Allied Newspapers. "Gozo tunnel 'front' unveiled". timesofmalta.com. Archived from the original on 9 March 2018. Retrieved 2 May 2018. ^ Ltd, Allied Newspapers. "Tunnel linking Malta to Gozo most viable option – Muscat; 'Queue' of consortia interested in project". timesofmalta.com. Archived from the original on 9 March 2018. Retrieved 2 May 2018. ^ Ltd, Allied Newspapers. "Transport Malta, university, to work together on sub-sea tunnel project". timesofmalta.com. Archived from the original on 9 March 2018. Retrieved 2 May 2018. ^ "Seismic survey for Malta-Gozo tunnel completed, Transport Malta announces – The Malta Independent". www.independent.com.mt. Archived from the original on 9 March 2018. Retrieved 2 May 2018. ^ Ltd, Allied Newspapers. "New air link in Gozo Ministry's plans". timesofmalta.com. Archived from the original on 24 December 2016. Retrieved 2 May 2018. ^ Mitev, Georgi. "Countryside Walk in Malta and Gozo". www.malta.com. Archived from the original on 3 October 2017. Retrieved 2 May 2018. ^ "Malta Public Transport". www.tallinja.com. Retrieved 2 May 2018. ^ "Car Hire in Gozo". visitgozo.com. Archived from the original on 3 April 2015. Retrieved 2 May 2018. ^ "Hop-on Hop-off Bus - visitgozo.com". visitgozo.com. Archived from the original on 29 August 2016. Retrieved 2 May 2018. ^ www.untangledmedia.com, Untangled Media -. "Gozo Hop-On Hop-Off -". www.citysightseeing.com.mt. Archived from the original on 10 October 2017. Retrieved 2 May 2018. ^ "Gozo's contribution to national GDP accounted for 4.2% or €473.4 m". Gozo News.Com. 20 December 2018. Retrieved 20 December 2018. ^ Pier, Meg (26 July 2009). "A magnificent island for many an odyssey". Archived from the original on 5 March 2016. Retrieved 2 May 2018 – via The Boston Globe. ^ "#Gozo ~ 1st Day ~ Winding Down in Westworld! – Georgia Rose Books". georgiarosebooks.com. 5 July 2015. Archived from the original on 28 July 2017. Retrieved 2 May 2018. ^ "Malta Beaches – Ramla Bay in Gozo". perfectbay.com. Archived from the original on 6 September 2017. Retrieved 2 May 2018. ^ "Gozo information Gozo related links, Accommodation | Mayjo Rent A Car". Mayjocarhire.com. Archived from the original on 30 January 2013. Retrieved 26 March 2013. ^ "Maltese Gastronomy and local cuisine". Gozo and Malta. Archived from the original on 25 March 2013. Retrieved 26 March 2013. ^ "inside-malta.com, Maltese Food, Holidays Malta, Book Malta Holiday Accommodation". www.inside-malta.com. Archived from the original on 25 March 2017. Retrieved 2 May 2018. ^ "Travel and Leisure News and Reviews from around the World". b-c-ing-u.com. Archived from the original on 28 June 2015. Retrieved 2 May 2018. ^ "euromic – ON SITE MALTA – Malta – News from Gozo & What?s on in Malta..." www.euromic.com. Archived from the original on 9 March 2017. Retrieved 2 May 2018. ^ "Paragon Europe". www.paragoneurope.eu. Retrieved 2 May 2018. ^ Camilleri, Ivan (3 July 2014). "Angelina Jolie and Brad Pitt blockbuster to be filmed at Mgarr ix-Xini". Times of Malta. Archived from the original on 18 August 2014. Retrieved 8 August 2014. ^ "Reg Com Gozo". lc.gov.mt. Archived from the original on 15 April 2015. Retrieved 16 August 2015. ^ "Reg Com Gozo". lc.gov.mt. Archived from the original on 15 April 2015. ^ Estimated Population by Locality – 31st March, 2014 – Malta Government, 2014. ^ Gallery, Malta Cruise & Tour Information. "Gozo – Places of Interest". www.seemalta.net. Archived from the original on 22 October 2017. Retrieved 2 May 2018. Head, Barclay; et al. (1911), "Islands Between Africa and Sicily", Historia Numorum (2nd ed. ), Oxford: Clarendon Press, pp. 882–3 . Wikimedia Commons has media related to Gozo. Wikivoyage has a travel guide for Gozo.